Survival is the name of the game in this alien arena! 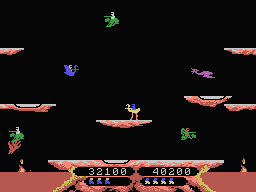 Never in your wildest dreams did you ever imagine you would be one day riding an ostrich in an alien arena, fighting for your life against other vulture-riding gladiators. And yet, there you are, and your only concern now is survival! Direct your ostrich around the arena and hit your opponents from above to turn them into eggs you can collect for extra points. If they hatch before you can grab them, they will come back into the fight stronger than before. Also watch out for the Pterodactyl who will appear randomly when you least expect it, and avoid the scorching lava pits below. How long can you last in the Joust? 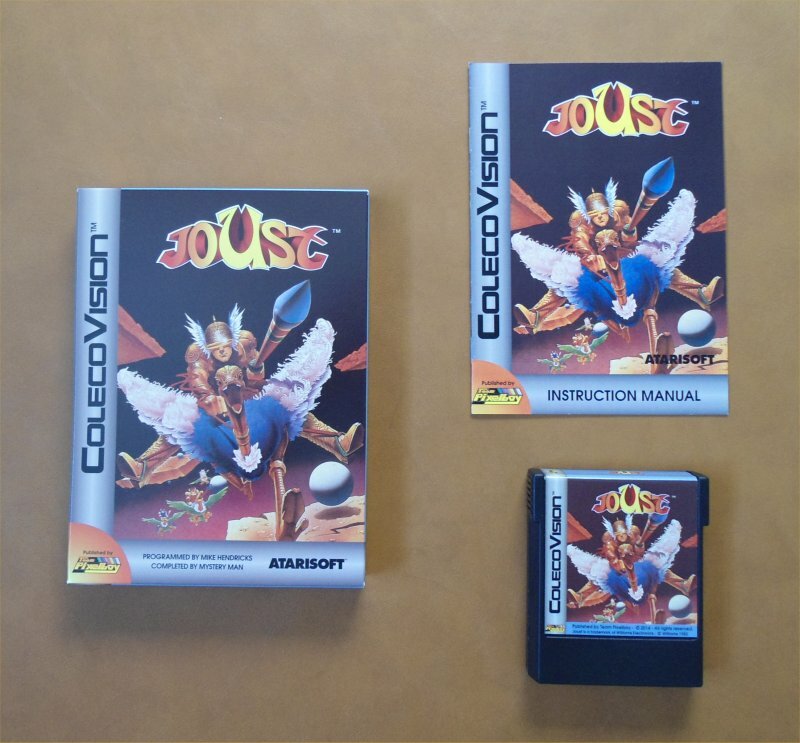 For years, a prototype ROM file of Joust for ColecoVision had been floating around the internet. It was playable, but it had no music or sound effects at all. Back in 2011, I tried to get Daniel Bienvenu to add sound to this soundless prototype, but that project was never completed. In March 2014, I received an e-mail from Sean Kelly. He happened to own a different prototype of Joust, and this one had sounds! He told me about his plans to release this prototype (and others) on cartridge, and I talked him into letting Team Pixelboy publish Joust. All that was missing from Sean's prototype was a proper title screen, so I convinced Mystery Man to add one. Convincing him to do this didn't require a lot of effort, as he was in fact quite honored to participate in the release of this well-known arcade port. The game was released at the Classic Gaming Expo in Las Vegas in September 2014, and the official release happened roughly a month later. SPECIAL THANKS: Sean Kelly, Reinhard Traunmüller, Dan Michaels, Christian Martin, Kendal Mertens, Jim Notini, Albert Yarusso, and all AtariAge forum members. 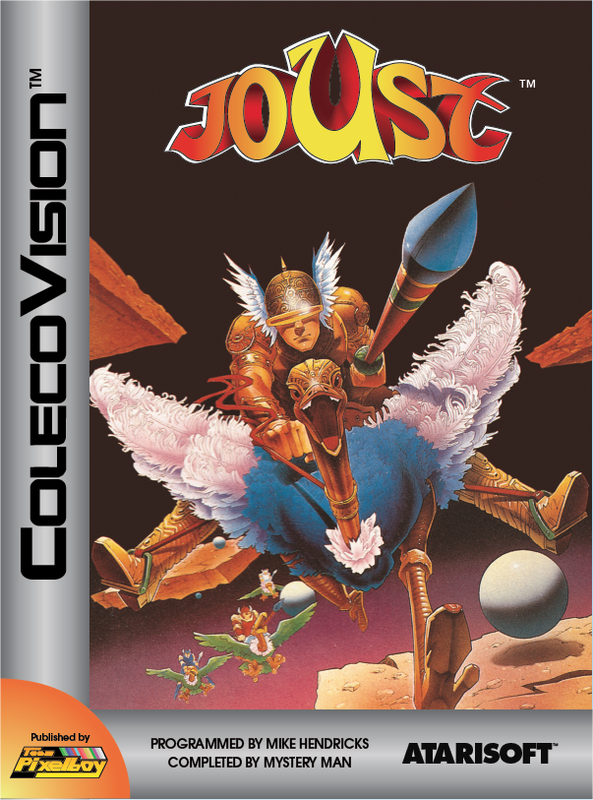 Here is a YouTube video of the ColecoVision version of Joust (with sound!). 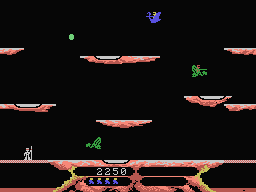 Joust © 1982 Williams Electronics Inc.